Allard has authored a motion asking the city to work with Manitoba Public Insurance to popularize the “Dutch reach,” a manoeuvre intended to ensure people in cars don’t fling open their doors and into the path of oncoming cyclists without warning. It was a topic of discussion on the Road Bike Review website in September 2016 with some cyclists supporting the concept while others felt it wouldn’t reduce the number of door prizes cyclists get while cycling city streets. IMPORTANT NOTE 1: A door prize is the colloquial expression for a traffic collision in which a cyclist is struck by a car door. The practice was mentioned in Martine Power’s article for the Boston Globe on September 22, 2013. The practice was also mentioned in a New York Times article dated July 30, 2011 and written by contributing writer Russell Shorto. The practice however was not called the Dutch reach in either of those article even though the practice has been the law in the Netherlands for decades. IMPORTANT NOTE 2: Dr. Michael Charney swapping driving a car for driving a bike in 1992, and has been an ardent cycling advocate in Cambridge (MA) over the years. This means that the term Dutch reach is about six months old even, and mainstream media and politicians are already making use of the expression in articles about car doors and cyclists. Idiomation therefore pegs Dutch reach to 2016 as attributed to retired American physician Michael Charney. UPDATE (2 November 2017): Please read the additional information on this entry provided by Dr. Michael Charney or click HERE to be taken directly to this latest comment. It’s as important to keep abreast of the new idioms, sayings, and acronyms as it is to know what the more aged ones mean and where they come from, and today’s entry is simply this word: SMOF. SMOF is an acronym for “Secret Master Of Fandom” and is a well-known phrase in science fiction circles. According to scifi enthusiasts, the word was coined by American science fiction author, Jack Laurence Chalker (17 December 1944 – 11 February 2005) who retired from teaching in his mid-thirties (after teaching in Baltimore for twelve years) to write novels and short stories full-time. He is best known for the Well World series of books, however, Amazon lists several of his books available for sale, however, he was far more prolific than just the listed novels. The Internet Speculative Fiction Database (www.isfdb.org) has a comprehensive list of the author’s works. But even that list isn’t exhaustive as he wrote 205 works according to the Online Computer Library Center. The details as to what the acronym means and who coined it is great, however, the acronym has come into its own as a word and is applied to the idea that there is a secret conspiracy group that controls the masses of scifi fandom. These SMOFs are allegedly responsible for trends in scifi genres and subgenres, media, authors, films, and television series, as well as changes to the aforementioned. Those who are recognized within the specific scifi fandoms are sometimes referred to as SMOFs due to the work they put into fandoms, thereby causing waves of changes within the scifi fandom community. The acronym has also become a verb in that when convention organizers or scifi gurus talk among themselves out fandoms, they are said to be smoffing. Except for those who wanted to gafiat, the fen of science fiction fandom for whom fiawol descended on Boston this weekend for their annual worldcon to smof and to buy old fanzines. And three years before that, in 1965, American science fiction and horror author and critic, Theodore Sturgeon (26 February 1918 – 8 May 1985) was mentioned in “D. Eney Proceedings: Discon 1962” and when another American science fiction author and critic, Peter Schuyler (P.S.) Miller (21 February 1912 – 13 October 1974) spoke about Sturgeon. He [i.e. Theodore Sturgeon] is also, in case he is willing … no, not in case he is willing; anyway, whether he likes it or not .. an Honorary Member of SMOF. Theodore Sturgeon (who was born Edward Hamilton Waldo, and who was a distant relative of US writer Ralph Waldo Emerson) was considered to be one of the most influential writers of the Golden Age of science fiction. He was responsible for writing the back story for Spock and the Vulcans in the original series episode, “Amok Time” for which he received a Hugo Award nomination. What this means is that the word smof and the acronym SMOF existed before Jack Laurence Chalker is credited for coining the term in 1971. How far back it goes, however, is unknown to Idiomation. Perhaps one of our avid fans who is knowledgeable in the area of science fiction history has the answer. If so, please feel free to share the information along with a link in the Comments Section below. Comstockery is a word not often heard these days, but it’s a word that has had a serious impact on the late 19th century and throughout the 20th century. What is comstockery? It’s censorship on the basis that there’s perceived obscenity or immorality in a piece of art, whether it’s literature, visual arts, song, photography, or any other related domain. While one might think that the word is an offshoot of the concept of sending someone to the stockades for public shaming after having committed a crime, the history is actually less complicated than that. It is interesting, however, to note that both sending someone to the stockades and comstockery had to do with public shaming. The word is directly related to Anthony Comstock. And who was Anthony Comstock? In 1872, using a pseudonym rather than his real name, Anthony Comstock (7 March 1844 – 21 September 1915) sent away for a copy of Victoria Woodhull’s book. She was a women’s right activist and her book told the story of an affair between American preacher and reformer Henry Ward Beecher (24 June 1813 – 8 March 1887) — referred to in the press as America’s most famous preacher — and one of his parishioners. It should be noted that Pastor Beecher was alleged to have strayed with three different women during his marriage to wife, Eunice Bullard White (3 August 1837 – 1897) with whom he had ten children. He had an affair with poet, Edna Dean Proctor, and was accused of having affairs with Elizabeth Tilton (her husband, Theodore Tilton leveled the accusation in 1874), and Chloe Beach. When he received the book, using a 1864 law that prohibited the distribution of obscene publications and images (where said definition was vague), he filed legal action against Victoria California Claflin Woodhull (23 September 1838 – 9 June 1927) and her sister Tennessee “Tennie” Claflin (26 October 1844 – 18 January 1823), who later became Lady Francis Cook by marriage. SIDE NOTE 1: Victoria Woodhull was the first female candidate for President of the United States, running for office in 1872. She ran on the Equal Rights Party ticket, fifty years before American women had the right to vote. SIDE NOTE 2: While Victoria Woodhull and her sister, Tennessee “Tennie” Claflin were arrested, jailed, and prosecuted on obscenity charges leveled against them by Anthony Comstock. They were acquitted of the charge. SIDE NOTE 3: Tennessee “Tennie” Claflin was the mistress of American capitalist Cornelius Vanderbilt (27 May 1794 – 4 January 1877) when she and her sister Victoria lived in New York City in the early 1870s. Anthony Comstock founded the New York Society for the Suppression of Vice, and the year after the filing his unsuccessful action against Victoria Woodhull and her sister, Tennie, the U.S. Congress passed the “Act for the Suppression of Trade in, and Circulation of, Obscene Literature and Articles of Immoral Use” on March 3, 1873 which became colloquially referred to as the Comstock Laws. The Act criminalized the sale and/or distribution of materials that were allegedly obscene or immoral, and made it a criminal offense to mail said materials through the federal postal system or to import said materials into the United States from abroad, whether by way of the federal postal system or any other means. Once the Act was passed, Anthony Comstock was named a Special Agent and was made a Postal Inspector for the United States Post Office, a position he held until 1915 (forty-two years). The Comstock Laws suppressed the works of authors such as D.H. Lawrence (11 September 1885 – 2 March 1930) and George Bernard Shaw (26 July 1856 – 2 November 1950) as well as medical texts. Some say that George Bernard Shaw coined the term comstockery in 1905 to mock the rampant censorship that was an ingrained aspect of society. SIDE NOTE 4: When George Bernard Shaw was prosecuted for his 1905 play, “Mrs. Warren’s Profession” he was acquitted on all charges. The negative publicity received in the press only made the play more successful, and theater patron flocked to performances. 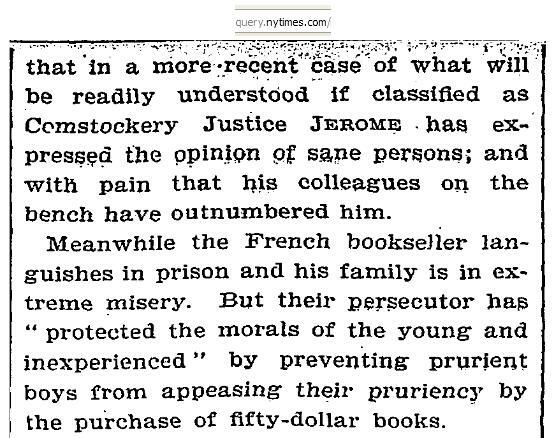 Our esteemed contemporary the Courrier des Etats-Unis relates the melancholy sequel of Mr. COMSTOCK’S latest raid, or latest but one, in the interest of … … what will be readily understood if classified as Comstockery Justice Jerome has expressed the opinion of sane persons; and with pain that his colleagues on the bench have outnumbered him. It didn’t take long for the word to take hold (less than a year), as the Los Angeles Herald of February 28, 1897 (just over a year after the New York Times editorial was published) used it on page 20 of that edition. The news bite originated with the New York Times, and was reprinted in the West Coast newspaper. The news article was part of a larger column titled,”Books And Those Who Make Them” and the column was edited by Enoch Knight. The snippet in question had to do with the Boston Bacchante at the Boston Public Library in Massachusetts. But such a disposition is incompatible with the Puritan conscience, which refuses to be at rest until its doubts are finally laid. When the Puritan conscience is complicated by culture, and questions arise touching the relation of art and morals, the result is very serious. Were the trustees, after all, guilty of Philletinism and Comstockery? Had they confounded immorality with morality, and assigned a work of art to a wrong jurisdiction? Was there not some fourth dimension in which the postulates of the sculptor and the police can be reconciled? Idiomation thereby pegs the word to the New York Times editorial staff on December 12, 1895 and the rest, as they say, is history. In researching the terms jaywalking and jay driving, Idiomation wondered what the term jay meant, and co research continued. In our travels, we came across another popular expression of the day: jay town. The term was used in a story titled, “Home” that was published in “Good Housekeeping” magazine in the September 1920 edition. The story was written by Kathleen Norris (16 July 1880 – 18 January 1966) and illustrated by Harry Russell (H.R.) Ballinger (4 September 1892 – 3 July 1993). It was a story about a woman named Fanny Bromley Lucas and her dear friend Angela Phillips, and takes place over tea. The story ran the gamut, talking about Arizona, California, Canada and Mexico. He was my first beau; he’s the only man I’ve ever cared for or ever will. But, Fanny, when we got home from our honeymoon, he was first with his uncle, and then in real estate with Joe Bonestell. Nothing satisfied him. This was a jay town, and the people were webfoots. INTERESTING SIDE NOTE: Kathleen Norris represented Good Housekeeping at the Democratic convention in 1920. The Lodi Sentinel of September 26, 1907 republished a news article from the New York Times about the Reverend Robert J. Burdette (30 July 1844 – 19 November 1914) of Pasadena, California. The former Burlington Hawkeye newspaperman, as he had been known across America, had recently visited his home town of New York City, and was disappointed with what he experienced. The article was entitled, “When New York Is A Jay Town” and included this in commentary in the first paragraph. And indeed the term jay town was a derogatory term as it appeared in the 1909 edition of “Passing English of the Victorian Era: A Dictionary of Heterodox English, Slang, and Phrase” compiled by British writer, novelist, playwright (and creator of one of the first female detectives in fiction) James Redding Ware (1832 – 1909) and published by G. Routledge & Sons in 1909. This dictionary identified the term jay town as an Americanism from 1889 that mean something was valueless. However, it’s an older term than that. In Volume 8, Number 201 of “Life Magazine” published on November 4, 1886, Alan Dale wrote this about jay towns in a brief article for the magazine. Between the acts I heard the remark from the lips of a swallow-tailed: “What do these folks take us for? If they had tried this on some jay town, it might have been less unpardonable.” Of course I did not know what a “jay town” was, nor do I know yet, nor shall I ever know, but I felt it was something rightly opprobrious and pleasingly condemnatory. Idiomation was unable to find an earlier published version of the expression, however, the term was well enough known to be published in a national magazine (even though it was in quotation marks) and that means the term was one that, while unfamiliar to some, was familiar to many. The expression is therefore tagged to at least 1880, and most likely dates back considerably earlier. Research for the term jay continues. Tune in again on Thursday to see what else Idiomation has uncovered. On Tuesday, Idiomation researched the history of jaywalking, and, in the process, learned that there was such a term as jay driving! Rather than just leave the discovery at that, Idiomation decided to delve a little more into the history of the expression. Jay drivers, as you know are drivers who don’t keep their vehicles in their proper lanes, wandering all over the road, putting everyone else in peril. The term didn’t disappear in the early 1900s once traffic laws were in place and jay walkers were being cited and fined for crossing the street where they weren’t supposed to be crossing, and it didn’t appear at the turn of the century and make a quick exit either! The St. Petersburg Times edition of December 10, 1948 talked about jay drivers by posting this amusing cartoon and important public service announcement in the newspaper. The problem of jay drivers plagued Miami during the 1930s which undoubtedly prompted the Miami Daily News — dubbed the oldest paper in Miami — to published this article on August 3, 1937. Things were so impossible between jay walkers and jay drivers, that the National Safety Council honed four important rules for those interested in being good jay walkers. Published in the December 28, 1934 edition of the Gazette and Bulletin newspaper of Williamsport (PA), the last rule (of which there were only four) shared this bit of insight. Let the motorist do the worrying. It’s his privilege as a driver. If you’re not hit the first time, don’t get discouraged. There’s a jay-driver on almost every street and it’s only a matter of time before the two of you will meet. The penalty for jay-walking and jay-driving should be made so severe that those brainless individuals would learn to obey the traffic laws. On September 7, 1923, The Evening Independent newspaper published an article that hailed a novel suggestion, as they called it, that was made by Mr. Horrigan that addressed the conditions and needs of St. Petersburg as a tourist resort. The fact of the matter was, as was pointed out “there are regular universal standard rules adopted by the A.A.A. that are used by almost every city, and certain laws passed by cities regulating traffic which are almost all alike so nothing need be said of them. It is merely up to our officers to enforce them.” The article included this commentary about jay drivers. 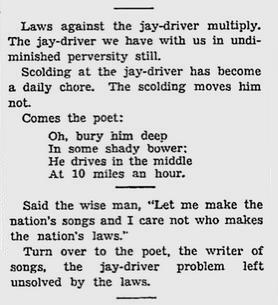 The trouble is with the drivers, and you will always have jay drivers, and no matter what rules you put into effect, the jay driver will not carry them out, or does not want to. Yes, jay drivers had everyone up in arms with their dangerous jay driving. Even columnist Richard Lloyd Jones of the Roundup Record-Tribune and Winnett Times (in Montana) commented on jay drivers and the “Safety First” movement that was meant to lessen danger everywhere except on streets and roads. The “Safety First” movement focused on making it safe for automobile owners to drive their vehicles, even if it came at the expense of pedestrian safety. His comments included this paragraph. Unless jay-driving is promptly stopped — unless every jay-driver is promptly jerked out of his seat and not allowed to return to the wheel, we are all going to be compelled to take our bumpers off and put on baskets. One of the more unintentionally humorous comments included in the column was that every speedometer should be made to town-clock size (in other words, the size of the car’s tire) and mounted on the back of the vehicle so that everybody would be able to read the speed at which the vehicle was traveling. An interesting statistic that was included in this story was this: In 1920 there were 10,007 deaths due to influenza, and 10,163 deaths due to automobiles! Is it any wonder that the same attitude carried over to automobiles? 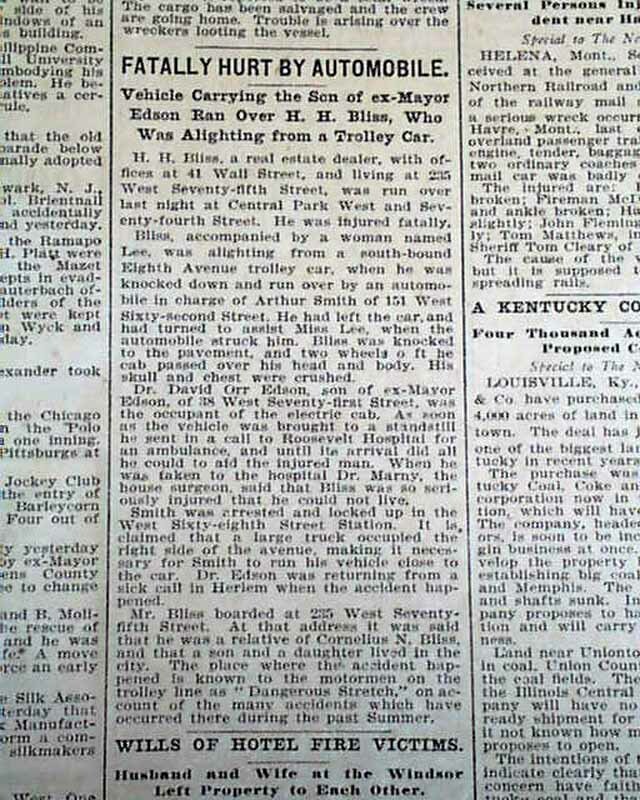 In any case, the unfortunate reality of jay drivers is that Henry Hale Bliss (June 13, 1830 – September 14, 1899) is the first person in history to have been killed in an automobile fatality. INTERESTING SIDE NOTE: On the 100th anniversary of this sad event, a commemorative plaque was placed on this site on September 13, 1999. It’s said that the plaque was erected to promote safety on streets and highways. The New York Times reported the story in great detail. In the end, the driver was acquitted of manslaughter charges on the grounds that it was unintentional even though the driver’s car had crushed the victim’s head and chest the day before he died from his injuries. So sometime between 1899 when the first ever fatal automobile accident happened and 1905 when the Albuquerque Evening Citizen newspaper edition of June 29, 1907 made mention of jay drivers, the words jay driver and jay driving were coined and quickly became known in English-speaking countries. Now to find out what a jay really is, other than a bird or a baseball player in Toronto.